Ancient Future Duet Hi-Res Photo (10.4" x 6.9" 300 dpi jpeg, 3.9 MB) by Jialiang Len Gao. This duet version of the pioneering world fusion music group Ancient Future features scalloped fretboard guitarist Matthew Montfort and hammered dulcimerist Mariah Parker. Equally at home on folk, new acoustic, Americana, and world music bills, this duet plays material with Celtic, Latin American, Indian, Arabic, Spanish, Eastern European and American folk themes. The program features music from Ancient Future's broad repertoire, including releases on Ancient-Future.Com Records celebrating 35 years of world fusion music: Planet Passion by Ancient Future (remastered to celebrate the 30th anniversary of the band), Seven Serenades for Scalloped Fretboard Guitar by Ancient Future leader Matthew Montfort, and Sangria by Mariah Parker. Recorded July 26, 2009, at Ancient Future's 30th anniversary concert at the Freight and Salvage. 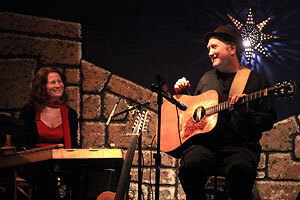 Shown: Matthew Montfort (scalloped fretboard guitar) and Mariah Parker (hammered dulcimer). Available in high resolution audio to subscribers to The Archive of Future Ancient Recordings. >YTmusic (Hammered and Picked repertoire). Studio recordings of the repertoire played by this band variation of Ancient Future. Sangria (Mariah Parker. 6:03). iTunes. >YTmusic. Mariah Parker composed this soulful 7/8 composition in D minor for Seven Serenades for Scalloped Fretboard Guitar by Matthew Montfort (Ancient-Future.Com AF-2008.) Digipak CD- $17.98: Add 1 to Cart. Buy 1 Now. I Mett Her in the Medowe (Traditional. New arrangement/composition by Matthew Montfort. 4:12). iTunes. >YTmusic. From Planet Passion by Ancient Future (Ancient-Future.Com AF-2010) CD/Gift Card, $17.98: Add 1 to Cart. Buy 1 Now. Matthew Montfort (scalloped fretboard guitar, composition) is the leader of the group Ancient Future. An award-winning guitarist, he is a pioneer of the scalloped fretboard guitar, a guitar that incorporates aspects of the South Indian vina. The guitar has a fretboard with the some of the wood carved away between the frets, forming a scalloped pattern. He has studied with the master musicians of many traditions of the music of world, including sarod master Ali Akbar Khan, and has performed with many legendary world music figures including Zakir Hussain. He has performed concerts worldwide, including at the International Festival of the Guitar in the Golden Coast of Spain. Mariah Parker (composition, piano, santur and hammered dulcimer), while completing her degree in music at UC Santa Cruz, worked with ethnomusicologist Fred Lieberman on the book projects of Mickey Hart: Planet Drum and Drumming at the Edge of Magic. She has worked with Dumisani Maraire (the brilliant Shona musician), Paulina Oliveros (the very well-known composer), and with tabla master Anuradha Pal (considered one of the best female musicians of India).